SVB wine forecast 2018: This will be a good year for the U.S. wine business. But what the wine business does next could determine the health and success of wine in the U.S. The first thing that Rob McMillan said at yesterday’s videocast for the SVB 2018 wine industry report was a warning. 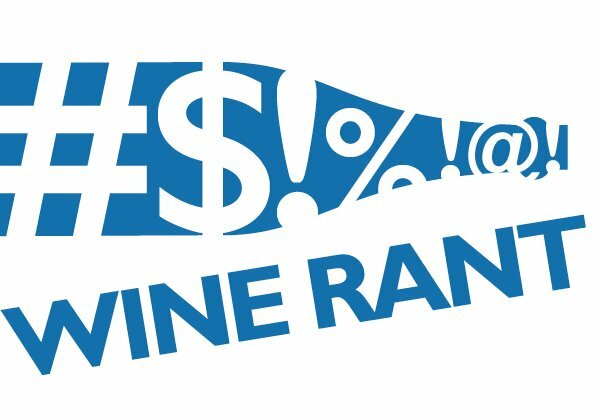 How seriously the ostriches in the wine business take his prediction could determine the fate of the U.S. wine business over the next decade. And the answer to that question, as I have written many times, may not be what the wine business wants to hear. It has focused on short-term growth, premiumization, consolidation, and wringing out profits at the expense of value and quality. And guess what McMillan said consumers, including and especially Millennials, are looking for in the wake of those developments? • Sales growth in the U.S., measured by volume, has been flat since 2013. This has not happened since the early 1990s. • The high-powered growth rate for wine costing more than $9, which has been the highlight of premiumization, is starting to slow. This is especially true for wines between $9 and $15, which has been among the fastest growing price ranges. • The bank’s clients, many coming from California’s top wine regions, have seen sales stall after a string of 10 percent annual bumps almost since the end of the recession. This is especially worrying, said McMillan, and nothing like this has happened since the early 1990s. 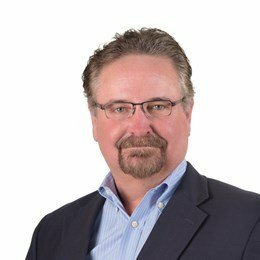 • Consolidation among distributors, which has been on hyper-drive for the past 18 months, seems to have hurt retail sales, funneling more business toward the biggest retailers. • Traffic to tasting rooms in Napa, Sonoma, and Washington state has declined. Which, frankly, is inconceivable to anyone who came of age drinking California wine. Finally, one bit of good news: Drink local seems to have become an established part of wine, said Mary Jo Dale, the marketing director, Americas, for Vinventions/Nomacorc, and one of the videocast’s panelists. Does the SVB wine industry report show the next stage in the evolution of the U.S. wine business? Are we watching the next phase in the evolution of the U.S. wine business? 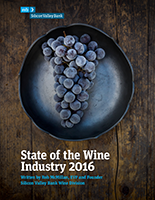 Perhaps, if Rob McMillan is spot on with his analysis in the annual SVB wine industry report. In this, the Baby Boomers – who have fueled the unprecedented growth in the U.S. wine business over the past four decades – are officially on the wane. Though they still control some 40 percent of the U.S. market, their clout is being passed to the two younger generations. 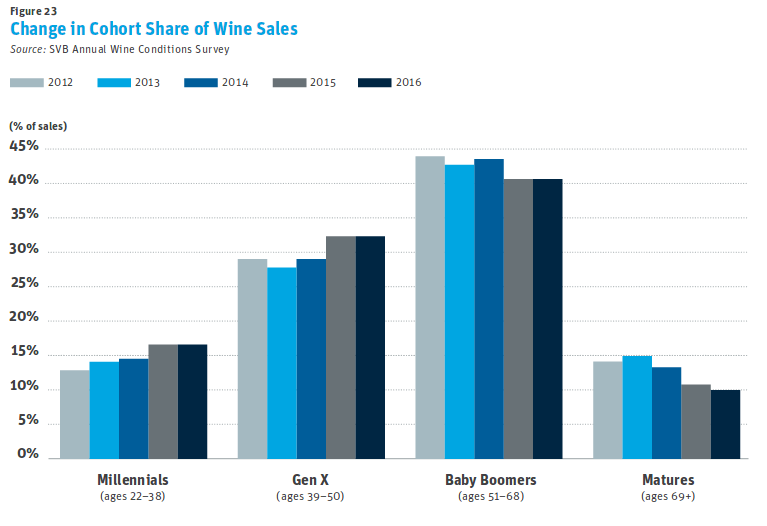 Both Gen X and Millennials are showing market share increases, and their 50 percent total has passed the Boomers (though, in wonderful irony, the vaunted Millenials drink about half as much wine as the Gen Xers). That’s the chart at the top of the post; click on it to make it bigger. And they don’t drink the same things that their parents and grandparents do, focusing on red blends and, surprisingly, sauvignon blanc, as opposed to the traditional varietals. The red blends, which I’ve written about extensively, were the subject of much discussion and consternation during the webcast; no one was quite sure whether these younger wine drinkers would stay with red blends or switch to the traditional varietals. 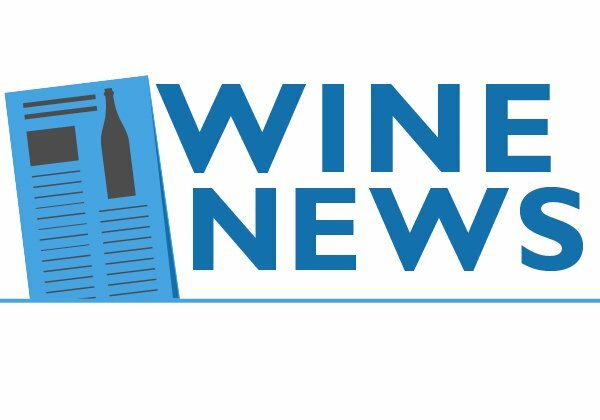 • The continued bifurcation of the U.S. wine market, with the annual decline in sales for wines costing less than $9 and growth in wine costing more than $12. The study expects significant growth in U.S. wine costing more than $15. • Increasing costs for U.S. producers – land, certainly, but also labor. How this will affect the business remains unclear, although it is one of the factors driving the bifurcation. Producers with more expensive wines can better afford to deal with higher costs. • Increased competition for wine from craft beer and legal marijuana, and especially among younger drinkers. • The increasing popularity of low-priced imports, and not just because of the stronger dollar. For example, there is little $10 California rose, mostly because of higher costs, but lots and lots of $10 French and Spanish rose. Hanging over the entire discussion during the webcast was where Big Wine fits into California’s future. The report expects winery mergers to continue (and the chart in on page 39 detailing winery mergers was as depressing as it was lengthy), but didn’t go much further than that. 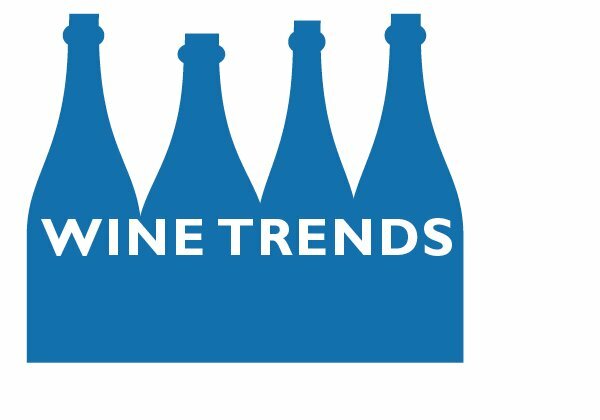 The webcast’s participants, including several comments from the audience, seemed to imply that Big Wine would define trends in style and that it was up to smaller producers to fill in the areas that were too small or too expensive for Big Wine to worry about. Which is also depressing — letting multi-national companies decided what wine would be made. Is the U.S. wine boom over? 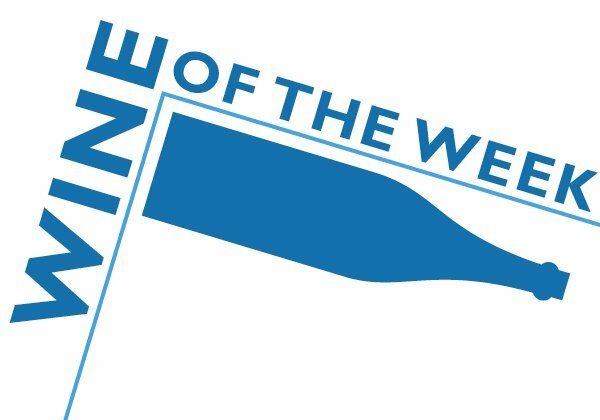 That’s the question that the annual Silicon Valley Bank state of the wine business report addressed last week, and the answer? It does look like the U.S. wine boom is over — for now, anyway. 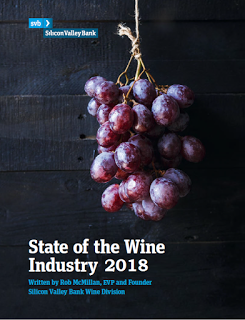 And though Rob McMillan, who writes the report, was optimistic that the slump may be short-lived, the fact that he cut through the usual pom poms and short skirts that pass for wine business analysis speaks volumes about how serious the situation is for anyone who loves wine. 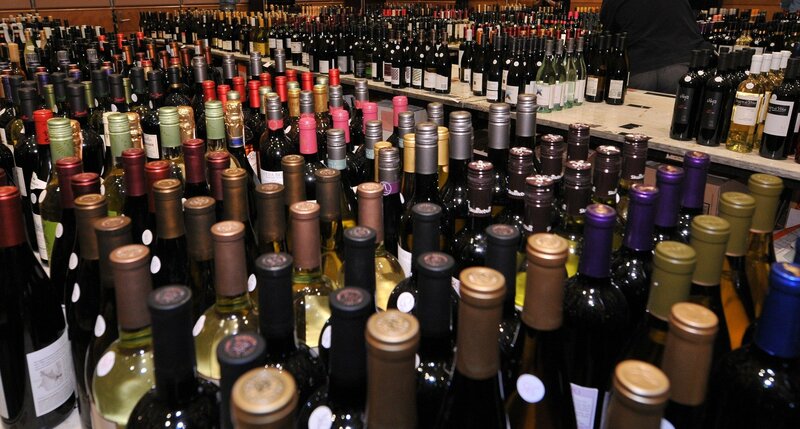 The report predicts a decline in U.S. per capita wine consumption after more than 20 consecutive years of growth, and while overall sales in dollar terms will increase slightly, sales measured by the amount of wine sold will remain flat for the fifth year in a row. That is also the end of a two-decades-old trend; after sales bottomed out in the early 1990s, they increased annually, even through the recent recession. 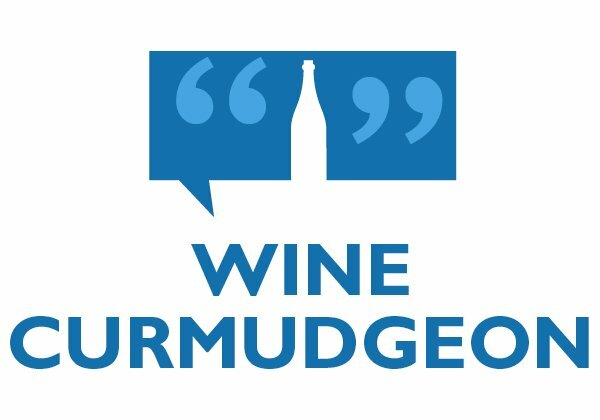 • The collapse in sales for wine that costs less than $6 a bottle, the boxes and jugs of Almaden and Carlo Rossi that have been some of the biggest cash cows in wine retail history. “That market is gone,” he said during the report’s webcast last week, “and it’s not coming back.” Yes, consumers are buying more expensive wine, but not as many of them are buying wine overall, and premiumization seems to stop at $15. There is little evidence that anyone is trading up higher than that. In fact, most news reports of the study downplay that bit about the Millennials, who are supposed to be the wine business’ savior. But anyone who is clear-eyed about the economy understands that that may not be possible. First, this isn’t the 1990s, when the gross domestic product grew three to four percent a year. Second, the Millennials, for all the talk about peak earning years, don’t have access to the same high-wage jobs the Boomers did 20 years ago. And third, without those high-wage jobs, they will have even more difficulty paying off an unprecedented $1.3 trillion in college loan debt. All of which means it’s more likely they’ll buy a $5 craft beer instead of a $15 bottle of wine.